Last year more than 3.3 million tons of electronic waste, better known as e-waste, was produced in the United States alone. With e-waste numbers on the rise each year, the state of Illinois decided to join 24 other states with e-waste laws to help decrease the amount that ends up in landfills. 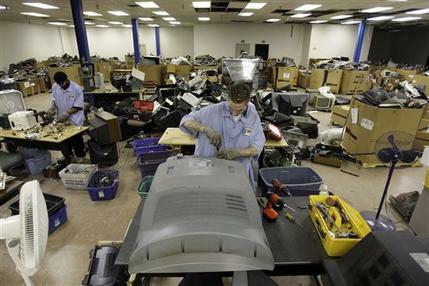 Since January 1, 2012, businesses in Illinois are now prohibited from sending old electronic equipment to landfills. While there is currently a law in effect that requires some of that electronic material to be recycled, the new regulation adds more equipment to the list, and it creates larger penalties for businesses that do not comply. How big are these penalties? Fines have increased to $7,000 per violation from $1,000. It seems foolish to accept a penalty when it is so simple to safely and lawfully dispose of your material. The hardest part of the e-waste recycling process is finding a recycling company that is both trustworthy and affordable. 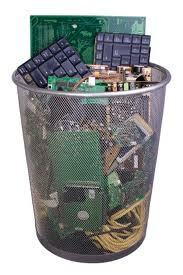 What you should be looking for is a company that handles e-waste according to state and federal regulations. This includes keeping the materials in the U.S., sending them to licensed recycling facilities, wiping all personal information from hard drives and tracking the materials from start to finish. If requested, the company you select also should be able to provide documented information about how your e-waste was recycled. As a heads up, you will probably be tempted to consider working with a recycling company that will pay you for your e-waste during this process. While that may seem like a good idea, it is almost guaranteed that your e-waste will end up in the wrong place, and will not be tracked according to established guidelines. It would be in your best interests, as a business, to stay away from that practice. Once you’ve picked a recycling company, the rest practically does itself. The recycling company should offer a few options on how to recycle e-waste. The most common services offered are dedicated pickups and on-site drop-offs. For a pickup, all you have to do is call the recycling company and schedule a time that works for both parties. If you choose to drop materials off, simply show up to the recycling location with your e-waste and the recycling company will handle the rest. Both options make the recycling process quick and painless. All of this brings us right back to where we started. Is it worth paying a $7,000 fine that could have prevented for a couple hundred dollars? Do yourself, and your business, a favor and find an affordable recycling company that plays by the rules. It will save you from dealing with future problems that could easily be avoided. If you have further insight on recycling e-waste, please feel free to share that information by replying to this post. President of EverLights, a commercial recycling services company located in Chicago. This entry was posted in Chicago News and Events, Green and tagged 000 fine, better known as e-waste, businesses in Illinois are now prohibited from sending old electronic equipment to landfills, Department of Homeland Security, e-waste, e-waste according to state and federal regulations, e-waste recycling, e-waste will end up in the wrong place, electronic waste, EverLights, how your e-waste was recycled, llinois decided to join 24 other states with e-waste laws, new regulation adds more equipment to the list, on-site drop-offs, paying a $7, recycling company, recycling e-waste, safely and lawfully dispose of your material, show up to the recycling location. Bookmark the permalink. Great article! Well written and to the point! Hello: Thanks for your comment. Please feel free to share this post within your network.